Grossmont High softball player Chloe Camarero, last year's league Player of the Year, goes after a grounder Saturday against Escondido. EL CAJON  To succeed, a good athlete needs an edge. For Grossmont High School junior third-baseman Chloe Camarero, her edge is inside her, driving her in everything she does. Last year the 5-foot-3-inch, 117-pounder drove herself to 1st Team All-CIF honors, 1st Team All-East County Team, 1st Team All-League, Player of the Year for the Grossmont Valley Conference and MVP of her team. She posted a .543 average with 35 runs batted in; despite batting from the lead off position. Camarero started playing softball and soccer when she was just 5. It was her first and most loyal coach who instilled this work ethic – her father Alonzo. 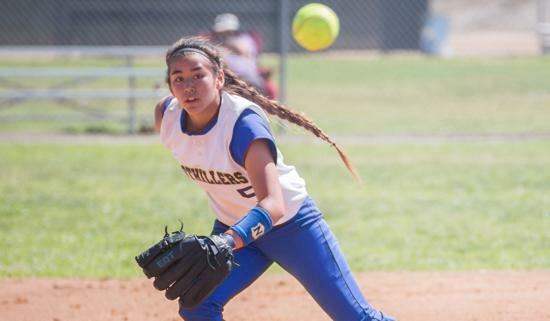 Camarero began competing in the Navajo Girls Fastpitch League. Her father would coach her every other year, giving her a chance to learn from other coaches. In 2012 she joined her first club team, the 14-Under San Diego Renegades. She moved onto the 16-Under Power Surge in 2014 and now competes for the 18-Under Gold SoCal Breakers. In soccer, she earned 2nd team all-league honors for the Foothillers. To concentrate more on softball, she no longer competes in club soccer, playing just for the school. But what happens when she gets frustrated on the soccer pitch? Through nine games this year, Camarero’s numbers are again impressive. She has 16 hits in 29 at bats for a .552 average. She has six doubles, one triple and leads the team with two home runs and five RBI. Her numbers are equally impressive in the classroom, carrying a GPA of around 4.0. “I have to work hard for grades. They just don’t come easy for me,” she said. She has already committed to attend Weber State University in Ogden, Utah, under third-year head coach Mary Kay Amicone in the Big Sky Conference. The future is bright at Weber State under Amicone. In just her second season last year, the Wildcats posted a 38-19 record, winning the school’s first Big Sky Conference title and a trip to the NCAA Regionals in Lafayette, La.